رامشت, محمدحسین, محمودی, طیبه, انتظاری, مژگان, ولی, عباسعلی, ربانی, علی. (1397). هویت مکانی و نقش آن در تبلور هسته مدنی ایران. پژوهشهای ژئومورفولوژی کمّی, 4(4), 56-71. محمدحسین رامشت; طیبه محمودی; مژگان انتظاری; عباسعلی ولی; علی ربانی. "هویت مکانی و نقش آن در تبلور هسته مدنی ایران". پژوهشهای ژئومورفولوژی کمّی, 4, 4, 1397, 56-71. رامشت, محمدحسین, محمودی, طیبه, انتظاری, مژگان, ولی, عباسعلی, ربانی, علی. (1397). 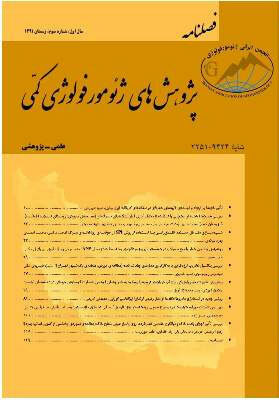 'هویت مکانی و نقش آن در تبلور هسته مدنی ایران', پژوهشهای ژئومورفولوژی کمّی, 4(4), pp. 56-71. رامشت, محمدحسین, محمودی, طیبه, انتظاری, مژگان, ولی, عباسعلی, ربانی, علی. هویت مکانی و نقش آن در تبلور هسته مدنی ایران. پژوهشهای ژئومورفولوژی کمّی, 1397; 4(4): 56-71. هویت مکانی یعنی همان خصیصه­ای که با حافظه تاریخی طبیعی مکان­ها ، بشدت در ارتباط است، به وجود آورنده متن جغرافیایی در فضاست. به‌عبارت‌دیگر چشم‌اندازهای سرزمینی، متون نانوشته جغرافیایی هستند که می‌توان آن‌ها را متنی مکانی در نظر گرفت، لذا با توجه به تنوعی که در طبیعت وجود دارد، با متون جغرافیایی متعددی روبرو خواهیم بود و هرکدام ویژگی­های تاریخی و فرایند­های جاری آن قلمرو را، تعریف می­کنند. ایران متن جغرافیایی متکثری است که تنوع و تفاوت‌های آن، پایداری فرهنگی این سرزمین را در طول تاریخ تضمین نموده است و پرسش اصلی در مقوله پایداری فرهنگی یک جمع متکثر، با تمسک به اصل تنوع در اکولوژی محیطی هدف اصلی این پژوهش است.این مقاله با اتکا به تحلیلی سینماتیک و روش‌شناسی ﻛﻴﻔﻲ با رویکرد تحلیل فضایی، علل این تفاوت‌های اجتماعی به‌ظاهر افتراق آمیز را در چهارچوب نظریه ورف در قالب متون جغرافیایی بیان می­دارد. نتایج حاصل از این تحقیق نشان می­دهد که: ایجاد فضایی ترامتنی در متون متکثر جغرافیایی ایران در قالب کلی واحد، سینرژی اجتماعی را شکل می­دهد، حافظه تاریخ طبیعی در ایران مرکزی بر اساس اصول آلومتری چیدمان فضایی مدنیت شهری و روستایی ایران را تعریف و هویت می­بخشد و دستگاه جغرافیایی ایران تنوع محیطی و سازمندی‌های متنوع اجتماعی را در این سرزمین به‌گونه‌ای در منظومه­سیاره­ای به هم پیوند می­دهد که مفهوم هویت آینه­ای تجلی آن است. Iran is a diverse land that diversity and differences in land and cultural more than 71 denominations, religion, people and language, and dozens of landscape different spatial and geomorphic is marked by such characteristics. This feature, according to classical geographers and sociologists have identified the cause of national weakness and always as a potential political challenges that have been mentioned however geographical new perspectives as the most important foundation territory of the same features of our national unity is guaranteed throughout history, they learned. The option to influence the events replicated when another dimension of space,Transtextuality space shape and location creates land identity. So as to cause questions of the organization of the geographic space between places and people in the know and the independence of the apparent distinction between deep link in the spatial organization that created and Iran as a whole unit is defined (Babajamali, 2014,17). Iran geographical system is a land of diverse landscapes linked together and creates a single space and identity and location of cities, villages and civil systems or other mental canvas of our land as defined and the results of crystallization of mirror the identity land. To achieve the research objectives of layers composed of two sets of the existing identity of place (6 elements) and social - cultural factors (22 elements) prepared and then define the relationship and linkage between evaluation matrix and 28 categories of information, two layers multivariate of space and civilization converted and then using analysis convex mirror laws (Gioncoli, 1991, 92) mercury content of this layer was assessed. The analysis of thirteen cities in central Iran was put to the test data show the core of a multi-layered identity of place and in that the circuit k, L and M in a simulation of a core model (Nils boor) will played. Then, with the extraction of concepts such as Knowledge Production Mass (NPM) and Culture Production Mass (CPM) each of these two factors were deemed equivalent to the area of ​​a circle and thus the production of knowledge equivalent radius (R) and the production of culture (R1) were extracted. Figure 2 get a radius of space identity numbers (F) and matrix identity den central cities compared to the urban space and the Nils boor core model were developed and based on the model of the central cities were classified into three groups according to space identity Figure 3. Then calculate the radius of the city's social identity (C), and based on the principles and rules of convex mirrors, the relationship between space identity and social identity crime while they can act as a marker of identity is being determined. This means that if a city's identity as a place to mirror radius and its distance from the mirror to the social identity of the mercury; it can be evaluated in the convex mirror. The central convex mirror of radius is equal to 6.27 times the distance of the mirror is 18.78 with social identity and this is the 13-city is being assessed and the necessary conditions for mirror gained. * It is space identity Iran central cities. This concept means the environmental differentiation isolated not only in Iran which is a fraction of an integral whole created as a mirror, as if broken the whole time there will be a mirror image of each of the fractions and mirrors cannot be separated from each other and show the detailed components. These words reveal the secret history of independence and knowledge of Iranian culture takes as well as to emphasize the environmental differentiation of the law as a whole maintain diversity in the ecological system environment (human and natural) called Iran and that many projects in the past few decades of separatism remains the most unproductive due to space identity and socio-cultural links and relations of space identify and cultural social of this land and Iran central core as cultural sun, Iran land gives coherence to the whole unit.